A recipe for making your own almond milk and avoiding the scary food additive, carrageenan. Carrageenan: the reason I (almost) always make my own almond milk. A substance derived from seaweed that’s been linked to numerous digestive problems and chronic diseases. Totally devoid of nutritional value, It’s often added to commercial almond milk and lots of other “health” foods as a thickening agent. 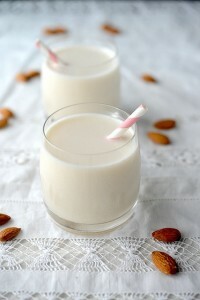 Actually, carrageenan isn’t the only reason I prefer homemade almond milk. This milk has a better flavor and consistency than any store-bought brand I’ve ever tried. Flavor has the final say. The following is pretty much the recipe and technique for any nut or seed milk you can dream up. Soak almonds in enough water to cover by a few inches for at least 8 hours. Drain and rinse the almonds before blending in a blender with 2 cups water until completely broken down. Squeeze liquid through cheesecloth or a nut milk bag (available online). 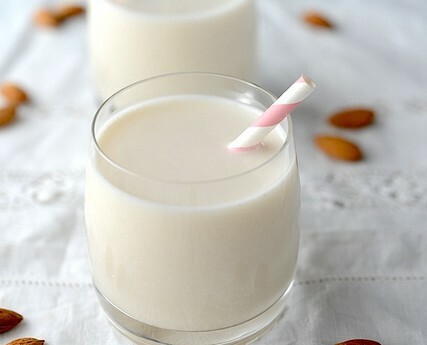 The liquid that exudes is your almond milk, discard the leftover pulp. Almond milk keeps well in the fridge for 4-5 days.